Daddy's Blind Ambition: Too much temptation? Things were going so well. He had a good first race in Arizona. He signed up for a marathon for later this year. He was getting accustomed to his new running spikes. He even got special accommodations for evening access to a track so he can get in his Wednesday track workout over the summer after the kids are in bed. But then yesterday we saw it while we were getting gas. The shopping plaza near our house has been undergoing a complete makeover since we moved last summer and we have noticed a few new places pop up. Until yesterday none of them were ones that might threaten Matt’s ability to make the U.S. Paralympic team. 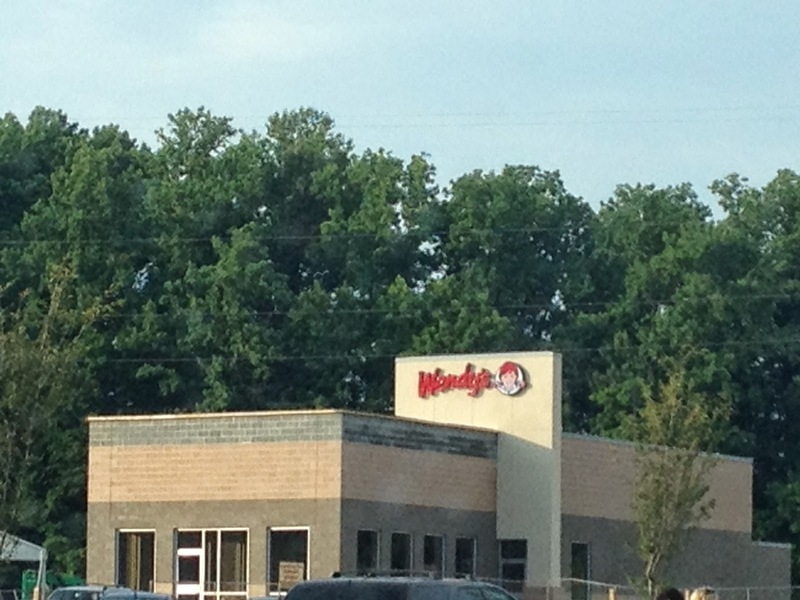 The building we thought was going to be a new bank is in fact the drive-in portion of a brand new Wendy’s. Matt loves Wendy’s. It is his favorite of the fast food chains. The gravitational pull towards Wendy’s might be stronger than the gravitational pull towards Sheetz when we drive through Breezewood on our way to Pittsburgh. Matt has never been in walking distance to a Wendy’s so this could be a game changer. He probably has a few more weeks at least until it is open for business, but he is already nervous. We might need to find an alternate route home so he isn’t tempted. It is bad enough that Dunkin Donuts, Domino’s, and frozen yogurt are already in the shopping plaza. If a Chipotle or a place that gives away free cookies opens up then Matt might as well throw in his towel and running shoes now. We'll see how he handles the temptation. Stay tuned.